Why is it only ever British films that have landscape-orientated posters? 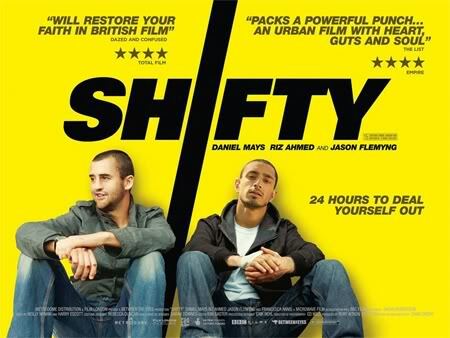 Shifty is the directorial debut of British director Eran Creevy and as you can see it’s got actor/rapper Riz Ahmed (who did Post 9/11 Blues), Daniel Mays (Nettle from Atonement) and Jason ‘Primeval’ Flemyng in it. How ‘not very good’ you ask? Don’t get me wrong, the acting, writing and direction are all perfectly competent, and the film looks pretty good too considering the budget. But it’s just so incredibly dull, predictable and unexciting. Shame really.